The city of Lulela, Sweden is situated in the frigid northern part of the nation. Just sixty miles from the Arctic Circle, temperatures in Lulea can sink as low -41C. Lulela has a big new resident; social media giant Facebook recently opened a brand new data center in this icy section of Sweden. The Facebook Lulela data center is the company’s first data center located outside of the United States, a sign of their commitment to better serving their European user base. While Lulela might seem like an odd choice for such a place, Northern Sweden looks to play host to servers from a variety of web operations, including Google. Facebook has over one billion monthly users, creating a significant amount of data for the social media giant to manage. Facebook users generate over ten billion messages a day, store in excess of three hundred billion photos, and create billions of “likes” a day. That adds up to a lot of data to store. Facebook’s choice of Lulela has been met with both praise and skepticism from users, environmental groups, and privacy advocates. Facebook’s choice of Lulela for its new data center was based on meeting two goals. Facebook’s first goal was to improve performance for its European user base, which required a new data center location that could increase speed and performance for users. Facebook has more users outside the US than inside, making the development of data centers outside the US a logical decision. The Lulela data center enhances user speed up to or beyond Google levels, which is a significant improvement. The new data center will be largely dedicated to storing “unused” data such as photographs that are infrequently accessed. Photographs account for a significant amount of Facebook traffic. Acccording to the company, over eighty percent of traffic goes to less than ten percent of its photos. The Lulela strorage center is capable of storing the equivalent of 250 million DVDs. Facebook’s second goal was to build an environmentally friendly center, keeping with its growing commitment to energy efficiency. The new data center is powered by hydro-electricity via a nearby dam that generates twice the power of Hoover Dam. In the event of a power outage the data center will depend on a stockpile of diesel generators. Lulela’s frigid environment was another selling point for Facebook; the eight months of icy winter will serve as a chiller for the five acres of server equipment. The facility uses the cold air to maintain a water evaporation driven cooling system. Surplus energy from the coolant system and the servers will be used to heat the data center’s office space. 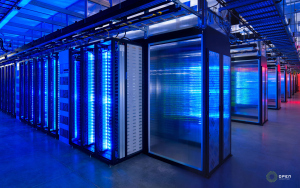 The “cold” system of data servers is rising in popularity due to its cost effectiveness and energy efficiency. Facebook’s new center operates on cutting edge energy efficiency levels; Facebook claims that the new data center is “the most efficient and sustainable data center in the world.” Facebook also chose a minimalist approach to their server equipment, forgoing the use of unnecessary plastic and metal cosmetic materials. Facebook’s decision to build in Lulela was also bolstered by a perceived corporate friendly environment in Sweden and a readily available skilled workforce. Besides providing a boost for European users, Facebook’s new data center handles live traffic from around the world. Facebook’s other data storage centers are located in California, Oregon, and Virginia, with another center in development in North Carolina. Noting the server problems that other web and communication providers have experienced, Facebook’s new data center also serves as a backup in the event of server crashes at their other locations. After some difficulties following its Initial Public Offering, the social media giant has doubled down on efforts to keep its user base satisfied. Facebook’s continued efforts to effectively monetize the site demand a high level of performance and consistency. Maintaining and storing user’s messages, photos, and other material, regardless if they are used or not, is an important part of Facebook’s effort to keep users logging on regularly. Some users have responded favorably to the new data center and its location, assuming that its European location will keep their valuable personal information and correspondence more secure. The recent news regarding the National Security Agency possible monitoring private communication and social media information has caused some Europeans to question the safety and privacy of their Facebook account. Facebook has repeatedly denied providing information to the NSA or other government agencies or participating in warrantless exchange of user information. This is not the first time Facebook has been accused of dispersing user information; there have been allegations that the site has allowed advertisers and other entities access to user information as well. Facebook accounts are ripe with personal information, including personal data, correspondence, pictures, shopping habits, interests, etc. This wealth of user information—and its value to advertisers—is one of Facebook’s most valuable assets. Facebook continues to face constant threats of malicious third party applications, phishing software, fake accounts, and data manipulation. Those who espouse the data center’s location as offering a security boost might be surprised to find out that Sweden is not necessarily a haven for web privacy. A law passed in 2008 allows the Swedish government to monitor and record any web traffic that crosses their borders without a warrant. This means that all of the live traffic and data going through the Lulela data center can be legally accessed by the Swedish government at any time, for any reason. Facebook’s increasing emphasis on user customization has the potential to dramatically increase the amount of personal information stored in its data centers. Barring a massive decline in its user base, Facebook will require additional data storage at some point in the future. Facebook has experienced a recent decline in downloads of its mobile applications, leading the company to consider expanding its partnerships with mobile device providers. It is too early to tell if the planned emphasis on mobile devices will have a significant impact on Facebook’s data storage requirements. Facebook looks to continue to develop new data storage technology. While Facebook handles the majority of data center design and development, it is not opposed to working with other tech and web companies to further innovation. This entry was posted in Technology Industry and tagged backup, Data Center, facebook, Luela. Bookmark the permalink.